Companion plants complement each other and play a major role in integrated pest management and nitrogen fixing to improve soil fertility. Critical factors in companion planting are; proper planning and thoughtful design which gives birth to a system that maximizes output and minimizes labour and input. Companion planting is one of the many horticultural practices and undoubtedly one of the best tomato growing tips in Kenya, and pretty much the world over, today. It involves growing more than one plant species in the same field in an effort to create a jointly beneficial situation for all plants. Companion planting is also used to foster better growing conditions in the case of a cash crop. Several goals can be achieved through companion planting. For one, you might use companion planting in an effort to introduce a trap crop that will attract slugs, insects, and other harmful pests from your tomatoes. When it comes to growing tomatoes, one of the widely known and advocated ways of organically controlling pests is through companion planting or using chemical sprays. Many advocators or organic gardening will of course opt for companion planting. You see, tomatoes are affected by several pests such as hornworms, white fly, aphids, insects, mosquitoes and flies, and red spider mite. Even though the pests absolutely love tomato plants, you can rest assured through companion planting the pests will find a brand new love in form of the trap plant. The following are some of the best tomato growing tips that will make companion planting a success. The best thing about companion planting in tomato gardening is that you get to accomplish two thing at the same time. If not for anything else because your tomatoes will get a conducive environment to be healthy and enjoy some duration of being pest-free, thus producing sweet, juicy, and lovely tomato fruits; and at the same time you will be able to grow herbs among other plants that you can find very useful inside the kitchen. With that being said, here is a list of the best and most used companion plants that you can team up with your tomatoes. 1. Garlic has proven very effective in repelling red spider mites. Alternatively, you can crush fresh garlic and create a concentration spray that you can spray directly on the leaves of your tomato plants so you can repel whitefly and aphids, and at the same time discourage the growth of fungus. 2. The other type of plant is marigold, which has proven effective in repelling the white fly, a very stubborn pest in the tomato garden. Just as an additional tip, you can also control pest by rotating crops in your tomato garden. 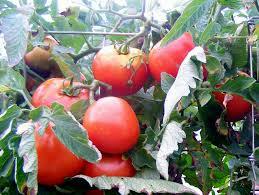 You should however ensure you don’t grow plants of the same family such as eggplant, peppers, and potatoes as they too will attract similar pests as those of the tomato plant, introduce something different you will be able to have tomato plates under control. Check out http://en.wikipedia.org/wiki/List_of_companion_plants for a comprehensive list of companion plants. For more information on companion plants to be planted with fruits and for certified fruit seedlings and plants contact us admin@plantafruit.org. Posted on January 23, 2014, in Environment. Bookmark the permalink. 1 Comment. Very informative. Will give it a try.